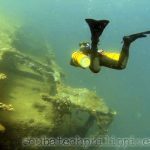 Scuba buoyancy control is determined by a number of different factors, such as breathing control, BCD/Drysuit inflation/deflation, weighting, trim and propulsion. 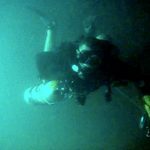 As we know from our initial scuba training courses, our relative buoyancy underwater is dictated by whether the weight of water we displace exceeds, equals or is smaller than our overall weight. If we displace a greater weight of water than we weight, then we will float. If we displace less weight of water than we weigh, then we will sink. If the weight of water displaced equals our weight, then we will be neutrally buoyant. Every diver should understand how Archimedes Principle relates to their scuba buoyancy control. The essence of effective scuba buoyancy control is for the diver to expand or contract air-spaces in their equipment (BCD or drysuit) and within their body (the lungs) to achieve control over the variable weight of water that they displace. By breathing deeper, or inflating our equipment air-spaces we displace more weight of water and become more buoyant. 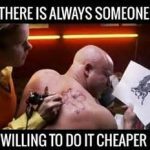 The opposite is true if we breathe shallower or deflate our equipment air spaces. When we get the ‘balance’ of inflation right, then we should neither sink nor float. The ‘ideal state’ that a diver should intend to maintain at all times is neutral buoyancy with their equipment, whilst breathing normally. This ‘ideal state’ should be maintained at all times; even when ascending or descending will cause ambient pressure increase/decrease to directly and proportionally impact upon the volume of our BCD/drysuit air-spaces. Efficient weighting is the foundation of proper scuba buoyancy control. 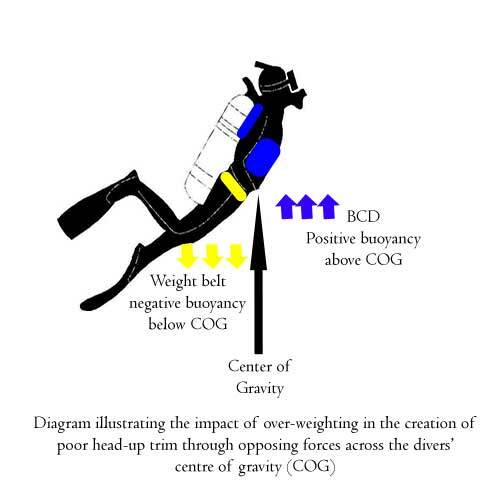 Being over, or under-weighted makes buoyancy control an increasingly more difficult task for the diver. Compensating for incorrect weighting often also requires physical effort – by fining or sculling to maintain depth. 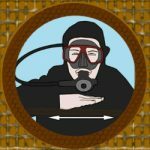 Consequently, any effort involved with conducting weight checks in order to optimize requirements will pay great dividends to the diver when they later seek to fine-tune their buoyancy. Many novice divers suffer from over-weighting. This is due to two primary factors. Firstly, some instructors favour over-weighting divers during entry-level training, in an attempt to mitigate the risk of uncontrolled ascent and because they feel it gives the student diver more stability to conduct skills whilst in a static, kneeling position. 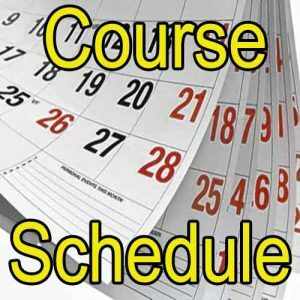 This is a very short-term outlook that often hampers the divers’ development afterwards. Secondly, many novice divers incorrectly attribute difficulty in descending upon insufficient weighting. In reality, most difficulties encountered with achieving an initial descent in the water are due to improper technique. 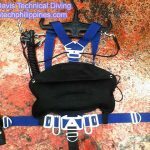 Regardless of the cause, many novice (and some intermediate-advanced) level divers find themselves over-weighted – which causes subsequent and unavoidable difficulties with their scuba buoyancy and trim control. 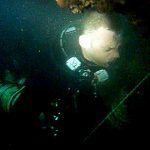 An over-weighted diver has to compensate by adding air to their BCD. This causes a dual push-pull effect across their horizontal centre-of-gravity (COG) and prevents effective flat trim. 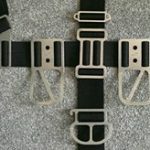 A heavyweight belt below the horizontal COG pulls the lower torso downwards. The air added to the BCD to compensate for that weight pulls the upper torso upwards. This ‘see-saw’ like effect creates a ‘head-up, feet-down’ trim for the diver that increases water resistance and reduces the efficiency of fining. Carrying surplus weights means that surplus compensating air must be added to the BCD on the descent. 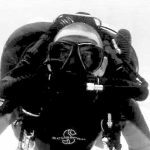 Apart from the impact upon trim (and, maybe, an increased ‘ungainliness’ and ‘ wallowing effect’ caused by the extra air migrating around the BCD as we move about), there is also a major impact on our scuba buoyancy when we ascend. Any air that is contained in our BCDs will expand on the ascent. The expansion is proportional to the constant reduction of pressure as we get shallower. More air equals more drastic air expansion. 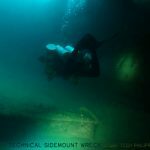 This is a major cause of uncontrolled ascents and missed safety stops for novice divers, especially as they reach shallower depths where the air expansion is greatest. For the record, a 1-litre volume of air displaces approx 1kg of fresh water (1.03kg of salt water). This means that to compensate for every 1kg of surplus weight, the scuba diver needs to add 1litre of surplus air to their BCD. Each litre expands constantly as the diver gets shallower. The over-weighted diver results in having much more air to add on the descent and dump on the ascent. 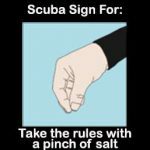 They also experience much greater fluctuations in their scuba buoyancy during even a small rise or fall in depth during the dive. Their workload is higher and a proportionately larger amount of their attention is required to constantly adjust their buoyancy for every minor depth change. 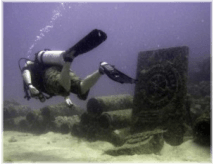 Scuba Buoyancy – Why do we carry weights? 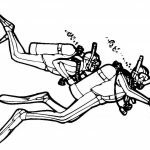 Divers carry weight to overcome any positive buoyancy that may be inherent in their bodies and equipment. The amount of weight they carry should be sufficient (no more, no less) to overcome that buoyancy. Any surplus weight carried has to be compensated by adding air to the BCD, which is inefficient and unnecessary. The most obvious source of positive buoyancy comes from the air that we put into our BCDs. Naturally, the volume of this air is variable and can (should) be completely expelled when we begin our descents. 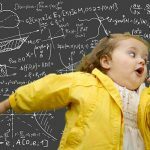 If we are thorough in releasing the air from our BCDs, this factor should not form any part of our weighting calculations. 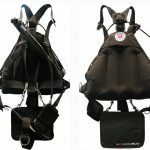 It can be surprising how often novice divers fail to fully deflate their BCDs on the descent – which is one issue that leads to a miscalculation of their weighting requirements. When descending, keep vertical and be sure to fully elevate the Low-Pressure Inflator hose so that all the air in the BCD is able to descend. It is a common novice mistake to not fully elevate the LPI and, consequently, allow some air to remain in the BCD (even though the LPI deflate button is depressed). 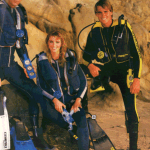 Another major source of positive buoyancy is the divers’ exposure suit. Neoprene wetsuits contain a volume of trapped air, which creates an amount of buoyancy relative to their size and thickness. This has to be balanced with sufficient weighting to allow descent. An average 3mm 1-piece wetsuit possesses less than 1kg of buoyancy whilst uncompressed. A 5mm 1-piece is approx 2-3kg buoyant. A 7mm 1-piece is around 6.5kg buoyant. Add a hood, vest and gloves to a 7mm suit and you’ll have in the region of 8.5kg of uncompressed buoyancy. The same is true of a drysuit, except that the air volume of that suit is variable and adjustable by the user. It is worth bearing in mind that the air volume trapped within an exposure suit is governed by the same pressures that affect the air in our BCDs. As we descend on a dive, increasing ambient pressure crushes the air within the exposure suit and reduces its buoyancy (and it’s thermal properties!). As we ascend shallower, the ambient pressure reduces and the material in the exposure suit re-expands with a consequent increase in buoyancy. Our concern with weighting for an exposure suit is primarily aimed at off-setting its buoyancy at, or near, the surface. As we descend, the reduction in the suit’s buoyancy will require off-setting by the addition of air to our BCDs (this should be the main reason why we add any air to our BCD underwater at all). The rest of our scuba kit will add, or reduce, some buoyancy depending upon the individual properties of that specific equipment. We have air-spaces inside our masks that are positively buoyant – so the volume of the mask contributes to our overall scuba buoyancy. Our BCDs may contain foam backplate padding and other materials that contribute to our over-all positive buoyancy. 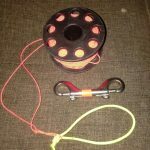 We carry metal clips, torches and reels that are negatively buoyant. Items such as fins may be either positively or negatively buoyant depending on their material construction. It is worth bearing these factors in mind when we are purchasing our scuba kit. 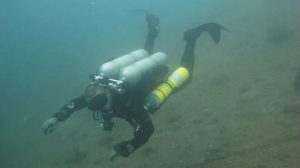 Scuba Buoyancy – Air Consumption. 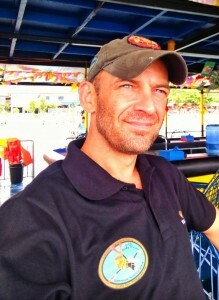 We also need some weight to compensate for the air that we use from our cylinders during the progress of the dive. Depending on the material, design and size of the scuba tank, the weight of the air that we consume can be as much as 2-3kg. The weight of air is (depending on pressure, temperature and humidity) approximately 1.2 grams per litre. To calculate your approximate weight of air, simply multiply the tank capacity (i.e. 11 litres for an AL80 cylinder) by its working pressure in BAR (i.e. 200 Bar). 11 litres (AL80) x 200 bar = 2200 litres. To calculate the air that you use, simply subtract the reserve (i.e. 50bar) from the initial calculation. 11 litres (AL80) x (200-50) bar = 1650 litres used. As we use this air, we become more buoyant. We have to add weight to offset for losing this weight of air by the end of the dive. The scuba buoyancy of cylinders is determined by the weight of water that they displace, compared with the actual weight of the cylinder, plus the weight of any gas contained inside. You can research the relative buoyancy (empty and full) of your cylinder online (see the cylinder specification tables). Steel cylinders are typically very negative and will remain negative even when the air inside has been consumed. In contrast, aluminium cylinders are less negatively buoyant. They are typically negatively buoyant at the beginning of the dive, due to the weight of the gas they contain. As gas is consumed, they can become positively buoyant. 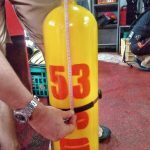 In most instances, a typical AL80 cylinder (aluminium cylinder commonly used by dive centres for rental) requires 2kg of weight to off-set cylinder buoyancy at the end of the dive, when reserve air capacities are reached (50bar/500psi). 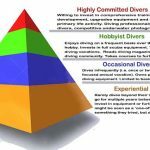 Depending on a person’s level of diving experience, there is a set of basic assessments that will enable a developing diver to evaluate their proficiency in scuba buoyancy control. As you gain experience and complete more scuba dives, assess yourself against the following criteria to identify where you can improve your scuba buoyancy control. • During dives, stop at will and hover horizontally at a constant depth, without adding/subtracting air to/from the BCD and without sculling or fining. • Demonstrate controlled descent to depth, stopping within 5’(1.5m) of the bottom. 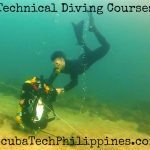 • Demonstrate buoyancy control and propulsion during the dive, without the use of hands. • Perform all buoyancy control or propulsion without the use of the hands.